With a population twice that of the United States and GDP growth greater than 5 percent, Southeast Asia is a large and dynamic region. By 2015, the ASEAN Economic Community (AEC) free-trade pact will be in effect, further energizing the region. The increasing flow of resources, goods, and capital will be especially beneficial to countries along the Indochinese peninsula. These countries are connected by geography but, until recently, were separated by historical circumstances. In particular, the economic spotlight is now on Vietnam and Myanmar. With a combined population of 150 million and economic expansion exceeding 6 percent annually, these nations are Southeast Asia’s new growth frontiers. 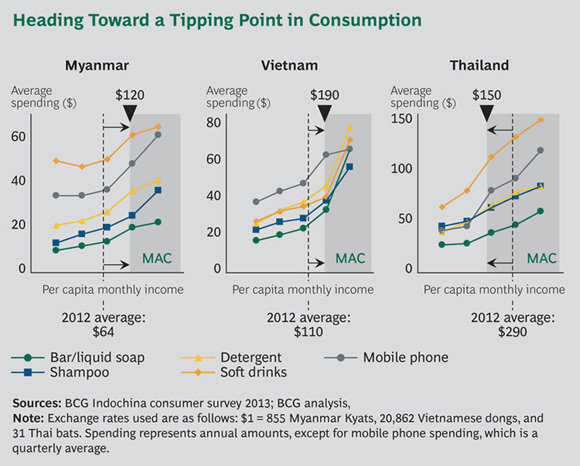 Indeed, Vietnam has the fastest-growing middle and affluent class (MAC) in the region. Between 2012 and 2020, this population of consumers will rise from 12 million to 33 million. Vietnam has been attracting foreign investment for several years. Samsung, for example, has won a license to invest $1.2 billion in production facilities in the country, while Nestlé recently opened a $240 million coffee-processing factory to serve Southeast Asia. Interest in Myanmar is more recent. Unilever and Coca-Cola have both recently opened local manufacturing facilities and are committed to making further investments. A joint venture between the Myanmar and Thai governments is developing a deep-water port in Dawei, on Myanmar’s Tenasserim coast. A new road through mountains and jungles will eventually connect a surrounding industrial zone of more than 200 square kilometers with Bangkok, 350 kilometers away. The development will help knit Indochina together and provide easy water access to India at an eventual cost of up to $50 billion. Both Vietnam and Myanmar have valuable natural resources—offshore oil in Vietnam and minerals, metals, gems, and timber in Myanmar. One of the little-known facts about these two nations is that their consumers are among the most optimistic in the world. The Boston Consulting Group’s consumer research shows that more than 90 percent of consumers in both countries expect to live better than their parents and expect their children to live better than themselves. (See Exhibit 1.) This level of optimism is among the highest recorded across 25 countries surveyed in the past year and is significantly higher than in China, India, and Indonesia. By combining consumer research with income forecasts, the CCCI study provides a perspective into where companies should target their efforts based on their product portfolio and how quickly those markets will develop. This analysis affords a more nuanced view of consumers and consumption than traditional consumer research. For example, many models set an arbitrary floor for the consuming segment that is adjusted by country based on cost of living or purchasing-power parity. The CCCI methodology, in contrast, sets the income floor on the basis of when actual spending starts to take off for a wide array of goods and services. Vietnam and Myanmar are not well known globally. A few facts help shed light on these countries and their people. Consumers in Myanmar and Vietnam are the most optimistic in Asia, with 93 percent and 95 percent, respectively, saying that their children will have a better life than they do. Consumers in Vietnam are among the most family oriented in Asia, with 69 percent saying they never spend money on themselves before the family’s needs are met. Vietnam has higher Internet penetration (43 percent) than Thailand (41 percent) or Indonesia (29 percent). Myanmar was the world’s leading exporter of rice before the collapse of the economy following a military coup in 1962. Vietnam and Myanmar should be on your radar screen. Vietnam is an attractive market today and will become more so. Now is the time to make smart investments and develop an expansion strategy. If Vietnam is a here-and-now opportunity, Myanmar is a more long-term play. The market is still developing, so there is time to learn and be focused in your strategy. Still, the history of all emerging markets shows that consumption takes off quickly as soon as the MAC class reaches critical mass. It is better to be early than sorry.